This talk will explore the development of ChiDG, an overset grid approach that employs the Discontinuous Galerkin approach for the solution of the Navier-Stokes equations. The methodology is presented along with example solutions and an invitation for attendee downloading and use. The approach permits arbitrary high order representations of the governing equations, curved elements and overset grids, the solver features quadratic convergence for the steady state form of the equations. Paul D. Orkwis , Ph.D. is Interim Dean of the University of Cincinnati College of Engineering and Applied Science. He is also Professor of Aerospace Engineering and Engineering Mechanics. Prof. Orkwis received his B.A. in Mathematics from Dowling College in Oakdale, NY in 1983, and his M.S. and Ph.D. in Aerospace Engineering in 1987 and 1990 respectively from North Carolina State University in Raleigh, NC. Upon graduation Paul joined the faculty at UC. 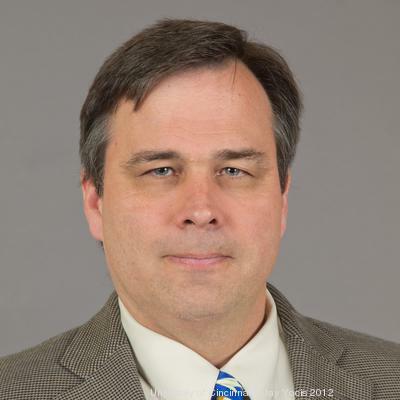 He has extensive experience working with the gas turbine industry via sabbaticals, consulting arrangements and membership in the GE Aviation University Strategic Alliance as well as long-term collaborative relationships with the U.S. Air Force Research Laboratory. His research includes application of CFD simulations for supersonic mixed compression inlets, combustor/turbine hot streaks, cooling hole interactions, turbine purge cavities, compressor near-stall performance, weapons bay cavities, vortex asymmetry about cones, flow control devices and aeroacoustics.